One call is all it takes to reduce the stress of making healthcare decisions. The Northwestern Medicine Glenview Outpatient Center offers you ready access to national award-winning, individualized care in one convenient setting, so you can get in, get taken care of, and get back to what is important to you. Our services include: Primary Care, Specialty Care, Pediatrics, Diagnostic Imaging, Cancer Center, Infusion Center and Immediate Care. Care at the Glenview Outpatient Center is provided by Northwestern Medicine physicians affiliated with Northwestern Medical Group. Physicians at the Glenview Outpatient Center are on the medical staffs of Northwestern Memorial Hospital downtown and/or Lake Forest Hospital in the north suburbs. From I-294 North or South, take the Willow Road (33) exit and travel east on Willow Road for 2.2 miles. Turn right onto Patriot Blvd. and Glenview Outpatient Center will be on your left. From I-94 North or South, take the Willow Road West exit (33A) and travel 3 miles west on Willow Road. Turn left onto Patriot Blvd. and Glenview Outpatient Center will be on your left. We understand that regardless of your role as a homemaker, working parent, executive or active individual, your time is at a premium. 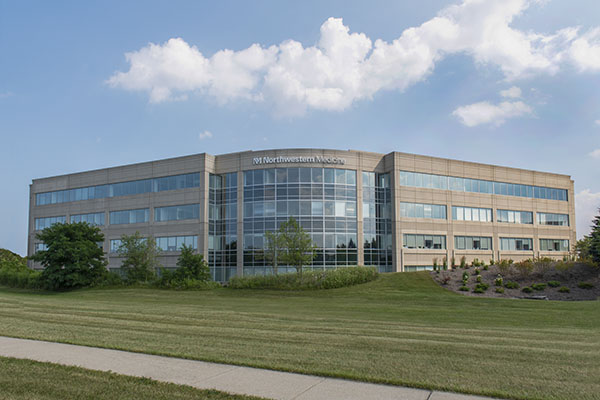 For that reason, we offer expanded access to Northwestern Medicine care in the northern suburbs. For a list of the Northwestern Medical Group physicians at the Glenview Outpatient Center, download this PDF. Medical Record Request: Authorization for Release of Information: Fill out this form to authorize the release of your medical records. Financial Assistance: At Northwestern Medicine Glenview Outpatient Center, we understand that medical expenses are often unplanned. To learn about our full range of Financial Assistance Programs, download our Healthcare Financial Assistance brochure in English or Español.